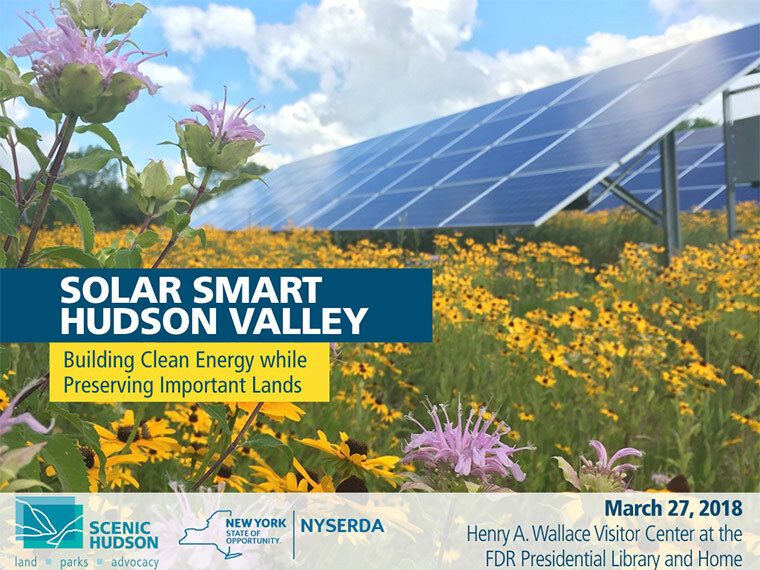 Our sold out spring 2018 symposium—"Solar Smart Hudson Valley: Building Clean Energy while Preserving Important Lands"—featured interactive discussions and presentations that explore important questions and tough issues surrounding the rapid development of solar energy projects in the Hudson Valley. Archived presentations from the symposium are showcased below. "The Climate Crisis and the Need to Transition to and Maximize Renewable Energy Resources"
An overview of the State policy, siting considerations and market forces that are driving solar energy development in the Hudson Valley. "New York State Renewable Energy Policy"
"Renewable Energy Drivers and Patterns in the Hudson Valley"
A presentation of the local, regional and global benefits of renewable energy development, and a conversation about the myths surrounding solar energy facilities. "The Benefits of Renewable Energy"
"How Shared Solar and Community Choice Aggregation Really Work"
"Debunking the Myths Surrounding Solar PV Systems"
A discussion of principles, strategies and tools for guiding development to appropriate sites and maximizing solar energy development through local comprehensive planning and zoning. "Central Hudson’s Hosting Capacity Maps"
"Clean Energy, Green Communities: A Guide to Siting Renewable Energy in the Hudson Valley"
"Developing Solar Energy Projects on Agricultural Lands"
"Town of Warwick: A Case Study"
An informational session on how to achieve mutual benefits in solar energy development through siting on conserved lands, use of pollinator friendly plantings, and re-use of previously disturbed sites such as brownfields and landfills. "Finding Common Ground: Land Conservation and Energy Production"
"Siting Solar PV Projects on Previously Disturbed Lands: Landfills and Brownfields"
A facilitated discussion of who the stakeholders should be, what information is needed, what form it should take, and the next steps for creating a renewable energy development plan for the Hudson Valley. "Vermont’s Act 174: Comprehensive Energy and Land Use Planning"
"A Path Forward: Identifying Least-Conflict Solar PV Development in California’s San Joaquin Valley"
"Regional Planning for Solar Energy Development on Long Island"
"Finding the Pathways to a Brighter Future for the Hudson Valley"
Scenic Hudson President Ned Sullivan's closing remarks.